A very unique performer, Paul excels in recounting his hilarious surreal observations. He leaves audiences crying with laughter, gasping for air and wondering "What the F? It's Paul F. Taylor!" 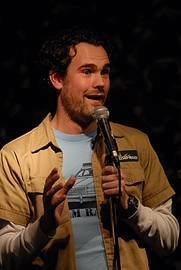 Paul is very much in demand and has performed extensively across the UK and abroad at such venues as The Comedy Café, The Frog and Bucket, Downstairs at the King's Head, Just the Tonic, Up the Creek, Guildfest 2008 and The English Comedy Club in Munich. When can I see Paul F Taylor?